The version we include of TOra in Mageia has Oracle database support disabled because we can't include the Oracle instant client packages due to licensing issues, so we have to do it in the same way I did it before at Mandriva: have on Mageia a package named tora with support enabled for MySQL and PostgreSQL only, and another one at TOra's download page called tora-oracle, which has additionally Oracle databases support enabled. I had forgotten to compile and upload these Oracle enabled packages to TOra's SF download page until today. Now you can find here these packages, but remember that Oracle instant client must be installed before running this version of TOra. If you don't need Oracle support then install the packages that come with the distro. Maybe we can add a get-tora-oracle similar to the get-skype package to download tora-oracle from TOra's download page, but the Oracle instant client still has to be manually downloaded and installed by the user. You can download Oracle instant client packages from here. Both oracle-instantclient11.2-basic and oracle-instantclient11.2-basiclite rpm packages work, but if you want to rebuild tora-oracle src package then you need to have oracle-instantclient11.2-devel too with the basic package. It's all about the games !! UPDATE (15/02/2012): Warsow was updated to 0.62 and World of Padman to 1.6. In the past months I have been working on many things for Mageia, like mentoring some novice packagers, fixing bugs, preparing updates for Mageia 1, and the usual packaging of new applications and updating existing ones. On this last activity I've been working really hard to get the biggest amount of games packaged for Mageia. I always have loved FPS games, so that kind of games have been my main objective. The autodownloader program uses a very simple configuration file where you specify the text of all of these screens and the mirror list from where to download the files with it's corresponding md5 hash. What I like the most of this autodownload technique is that we can use it for other programs that can't be included on the distro, not even on the non-free repository, like skype or flash plugin perhaps ? Urban Terror is a free multiplayer first person shooter developed by FrozenSand, that (thanks to the ioquake3-code) does not require Quake III Arena anymore. It is available for Windows, Linux and Macintosh. Urban Terror can be described as a Hollywood tactical shooter; somewhat realism based, but the motto is "fun over realism". This results in a very unique, enjoyable and addictive game. There's an excellent video that shows the gameplay of the game on youtube. You can find more screenshots here. World of Padman (WoP) is an open source first-person shooter computer game available in both English and German. Originally it was a modificationfor the game Quake III Arena titled PadMod created in the year 2004. After the source code for Quake III Arena was released, the game became standalone. The idea is based on the Padman comic strip for the magazine PlayStation Games created by the professional cartoon artist Andreas 'ENTE' (German for "Duck") Endres, who is also the man who made many of the maps included with the game in 1998. Smokin' Guns is intended to be a semi-realistic simulation of the "Old West's" great atmosphere & was developed on Id Software's Quake III Arena Engine. Gameplay as well as locations are inspired by Western movies, particularly those from the Spaghetti Western genre. This game has it's own engine called ioq3ztm, which it's a modified ioquake3 engine to support additional features like the four player split screen. 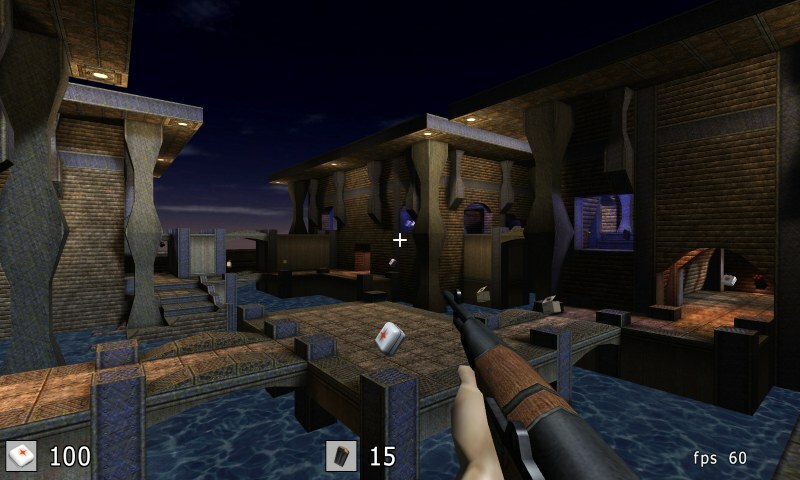 Cube 2: Sauerbraten is a free multiplayer/singleplayer first person shooter, built as a major redesign of theCube FPS. 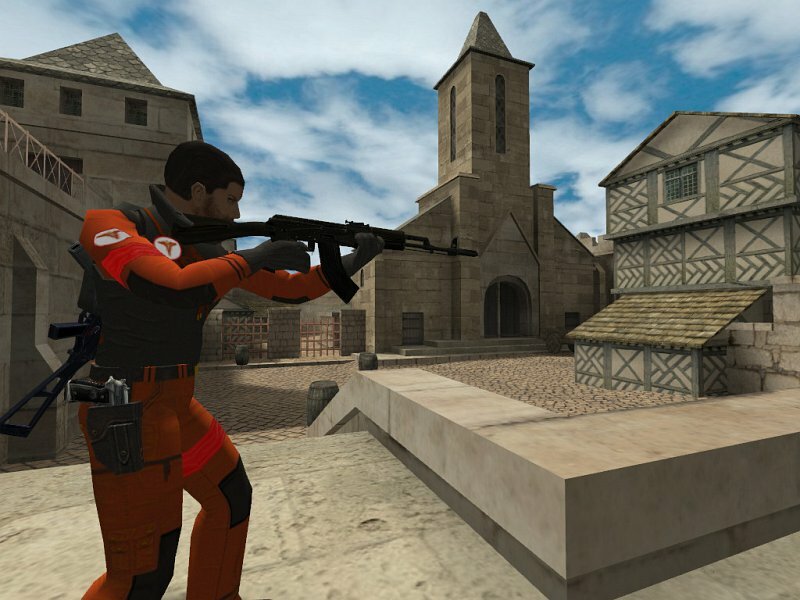 AssaultCube is a FREE, multiplayer, first-person shooter game, based on the CUBE engine. Taking place in realistic environments, with fast, arcade gameplay, it's addictive and fun!